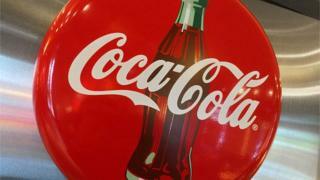 The US firm Coca-Cola has said it will cut about 1,200 jobs due to falling demand for its fizzy drinks. Its global carbonated drink sales fell 1% in the quarter to 31 March, Coca-Cola said. Coca-Cola and rival PepsiCo's sales have taken a hit as consumers in North America and Europe have increasingly turned away from sugary drinks. The Coca-Cola cuts will begin in the second half of 2017 and continue into 2018, the company said. The firm said it was increasing its cost-cutting target by $800m in annualised savings, and now expects to save $3.8bn by 2019. The majority of the extra cost savings will come from corporate job reductions, incoming chief executive James Quincey said in a conference call. A spokesperson added that savings would also be made through the firm's supply chain, marketing, and changes to its operating model. Coca-Cola added that it expected its full-year adjusted profits to fall by between 1% and 3%, compared with the 1% to 4% decline it had forecast in February. The firm has more than 100,000 employees globally.